On the death of King Henri IV, Marie de Medici became queen regent and ruler of France until her son Louis XIII was old enough to assume his full responsibilities as king. This change in leadership posed a challenge to Champlain’s vision for New France, as neither Marie de Medici nor her closest advisers had much interest in exploration and settlement in North America. During this period, Champlain worked to establish relationships at the French court and with influential members of the Catholic church in order to secure support for ongoing exploration and settlement in New France. Late in 1610, he entered a contract to marry Hélène Boullé of Paris. The wedding took place at the church of Saint-Germain-l’Auxerrois on December 30, after which Hélène returned to the home of her parents where she was to remain until she turned 14 in 1612. In March 1611, Champlain once again departed for New France. He arrived at Tadoussac in mid-May and immediately travelled up the St. Lawrence River, stopping first at Quebec before continuing to today’s Lachine Rapids, where he intended to meet his Aboriginal allies. During this journey, he explored and mapped the present site of Montreal, where he planted a number of test gardens. 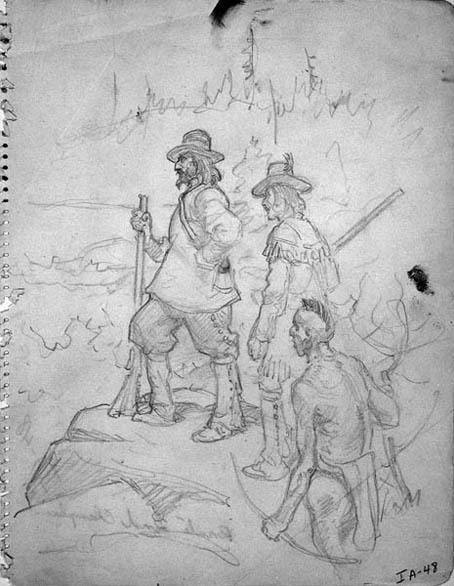 He then met with his Huron (Wendat) allies at the rapids, where he was reunited with Étienne Brûlé. At the same time, Savignon, who had accompanied Champlain to France in 1610, returned to his people and recounted stories of his experiences across the Atlantic. Following the departure of the Huron (Wendat), Champlain met with his Algonquin (Anishinabe) colleagues and through celebrations and meetings, as well as the exchange of young men from both cultures, they further strengthened their alliance. Champlain returned to France in the fall of 1611 and continued his work building alliances and support for New France at the French court. His efforts paid off in 1612, when Louis XIII appointed Charles de Bourbon, Comte de Soissons, as lieutenant-general and viceroy of New France, and granted him a 12-year monopoly of the fur trade. Soissons selected Champlain as his lieutenant, with orders to find a trade route through Canada to Asia. Soon after these arrangements were in place, Soissons died and his nephew, Henri de Bourbon, Prince de Condé, purchased the office of lieutenant-general, admiral and viceroy of New France. Like his uncle before him, he was granted a 12-year trade monopoly and also appointed Champlain as his lieutenant with expanded powers in New France. Champlain returned to the St. Lawrence Valley in 1613, with his new title and with plans to travel farther into the interior of the continent.